I’m crossing the Channel in a hairdrier. Or so it seems to me. 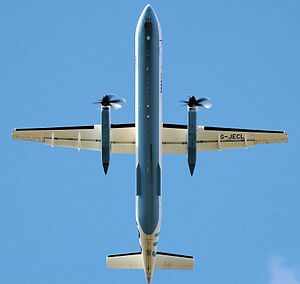 As soon as the pilot starts the twin engines of the small Flybe Dash 800 on which I’m travelling to Jersey, the propellors judder noisily with that distinctive buzz normally associated with a blow-dry. It makes my whole body vibrate. Though the speed of their rotation soon renders the propellors invisible, the noise only increases and I quickly realise it’s going to be with us the whole way – in the unlikely event that the engines don’t drop off along the way. I should have anticipated that our plane would be so tiny when the stewardess at the gate told us we’d be “walked” to it for boarding. To be able to nuzzle up so closely to the terminal, the aircraft would have to be pretty small. It turns out to be only slightly bigger than the Air Luxembourg plane I took once as a teenager when couriering computer parts for my engineer father. (Well, Luxembourg is a tiny country, they have to make best use of their airspace.) As one of a small group of passengers, I was put on a bus to the plane. After a few moments’ drive across the tarmac, the bus stopped and opened its doors. I was puzzled – why were were stopping when there was no plane in sight? Only when I stepped off the bus did I discover why: the plane was so small that it fitted below the sightline of the bus window. On board awaiting take-off, a chirpy stewardess strolled down the aisle offering a quaint straw basket of sweets. We passengers each seized a handful, hopeful that they contained an anti-emetic, if not cyanide. But our Jersey-bound plane today proves bigger inside than it looks. The official capacity is 78 passengers. About a third of this number are on board. The stewardess quickly curtails anyone’s intention of spreading out. We sit very still after that, worried that the slightest motion could change our course. Flip a page of the inflight magazine too quickly and we could end up in Guernsey – or the sea. In less than an hour, we’re landing in Jersey, but only after a white-knuckle touchdown. Never usually an anxious flyer, I think I’m about to become one. Normally I love the moment when the plane first contacts the ground, making you suddenly aware of the tremendous speed at which you’ve been travelling. But this time the rush is too much. It’s accompanied by loud gasps and ill-suppressed shrieks. Moving as one, we grip the back of the seat in front of us, stiff-armed to guard against concusion on its headrest. If ever there was a moment in my flying experience that I’ve expected the stewardess to cry “BRACE, BRACE!” in earnest, as heralded in every preflight safety talk, this is it. If we carry on taxiing at this rate, we’ll run out of Jersey before we stop. We’ll be ditching into the sea beyond its shore. That lifejacket under my seat is about to see active service. I make a mental note not to inflate it before leaving the aircraft. But in the nick of time, the brakes take full effect, and not a moment too soon we’re inside the tiny terminal claiming our baggage from the carousel. As I wait for my polka dot travel bag to appear, I wonder why no-one ever warned me of the perils of this tiny, bumpy, noisy flight to Jersey. Is it because I don’t know anyone who’s lived to tell the tale? 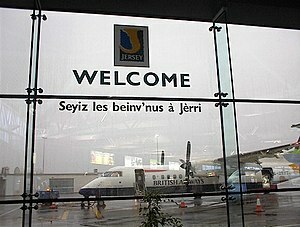 Ah, but I do – and it comes back to me that just the other week a friend was singing the praises of Channel Island flights. Who was it again? Ah yes, my hairdresser, Natasha. Well, I suppose for her, travelling in a hairdryer would make her feel right at home. Next Post What Size is Your Jersey?